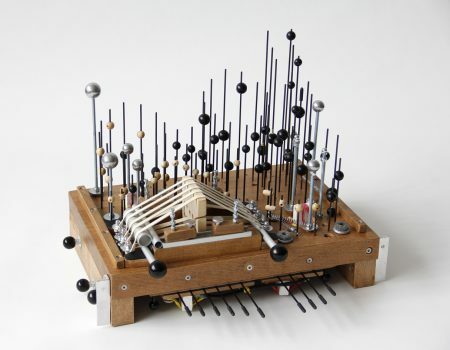 In summer 2015 Andreas Oskar Hirsch finished constructing the Carbophone, an electroacoustic invention pushing the concept of the African Kalimba or Mbira. Vertically set up carbon rods, metal bars as well as a rubber band gamut make up this plucking instrument which opens up a whole variety of sound possibilities and features rather particular overtones. Initially, Early Carbophonics was produced upon invitation by Radiophrenia, a Glasgow based temporary art radio station run by Mark Vernon and Barry Burns, and the pieces were broadcasted for the first time in late summer 2016. 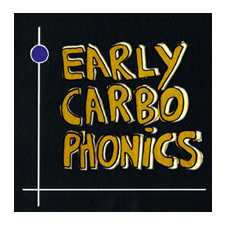 Here, Early Carbophonics are compiled on vinyl, and in contrast to the also digitally distributed tracks, the pieces are mixed into each other on the record. Sketches from the rehearsal room are combined with more refined pieces through editing processes, sampling and effects resulting in electronic music with a warm analogue lo-fi feel of its own. Straightly rhythm driven tracks are followed by ambient oddities like the promenade of an octopus or a probably senile shipwrecked robot that emerges from a castle moat and starts speaking to you with a haunting voice. Occasionally, the Carbophone is accompanied by some other instruments like a Morse key, a Moroccan flute or the Electric Palm Leaf. The Carbophone is Hirsch’s own invention and the first one was only constructed in 2015, so there’s a tongue-in-cheek aspect to the name “Early Carbophonics”- but despite being an acoustic instrument built with a wooden base and carbon rods, the tone of the instrument, and of this 26-minute mini-album as a whole, is so close to the playful weirdness of 1960’s experimental electronics that it really does sound like a throwback to what might get labelled early electronic music. In terms of intention, it references the African Kalimba or Mbira, and the layered rhythms in pieces like “Octopus Promenade” do have shades of traditional African music, while others like “Balfolk” sound more like Eastern European folk instrumentation reworked into mesmeric repetition that borders on analogue techno. “Castle Moat Robot” would not sound out of place in a Radiophonic Workshop retrospective, while “Full Moon Hula Hoop” sounds like an attempt to construct a more modern, faintly glitch-steppy piece but solely using a wood-toned instrument. Stuart Bruce / Chain D.L.K. (…) Hirsch also uses electronics and sampling to further enhance the music. Sometimes he also uses “a Morse key, a Moroccan flute or the Electric Palm Leaf”. It is quite a lovely record. If it was just his instrument I think I would have loved to see it rather than hearing it, thinking it might not be possible the way it sounds now. But since we know there are electronics used, it makes quite a difference, and the record is no longer a demonstration of an invention, but it becomes lovely little pieces. Most of these with rhythm, but he can as easily drift off in a more ambientesque pattern or overload his effects with a robot like effect. It is not difficult to see why a radio program would transmit this, as it is all full of life and little drama. Excellent record, again. 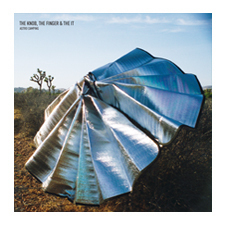 (…) This album is a document of pure creativity. The time Hirsch must have spent in constructing the instrument to be a deep and fully performable compositional interface is on full display with one listen to this album, a treasure trove of fresh sounds and visionary arrangements inspired by them. Like the best works of Zoviet France or Stockhausen, Early Carbophonics seems to channel the trends and logic of a civilization which never existed, to catch some wisp of a mystic, instinctual ancientness within its modern means. 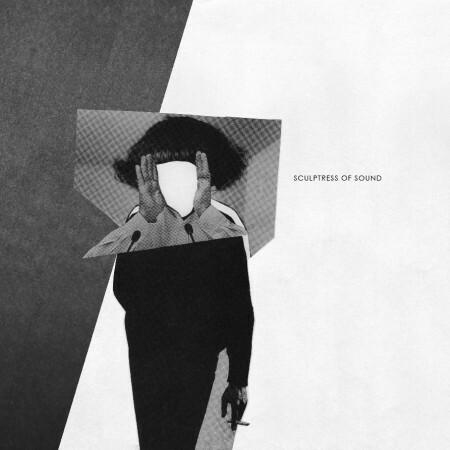 Highly recommended to fans of musique concrete, industrial, and other psychically active sound texture. (…) Der Kölner Andreas Oskar Hirsch ist da schon etwa sortierter. Für Early Carbophonics (Makiphon) hat er eigens ein neuartiges akustisches Instrument entwickelt und gesampelt. Das Carbophone ist eine großformatige Resonanzbox mit stimmbaren Gummibändern und Klangstäben aus High-Tech Karbon-Verbund-Material. Das klingt mal nach einem westafrikanischen Mbira in größer und technoid-metallischer, mal nach Xylophon-artiger Holzpercussion zwischen Marimba und Balafon. Auf der Mini-LP klöppelt sich Hirsch locker durch die klanglichen Möglichkeiten seines Instruments. Ähnlich wie bei den Rhythmusminimalisten vom ersten Wiener Gemüseorchester (siehe Motherboard November 2018) erhalten Hirschs mehr oder minder dichte elektroakustische Soundscapes über ihre quasi-westafrikanisch anmutende Klangcharakteristik einen organischen lässigen Groove. Scheduled for release on December 7th, 2k18 via the Makiphon label as 10″ vinyl album are the “Early Carbophonics” produced by Andreas Oskar Hirsch, his first recorded take on his self-developed instrument named the Carbophone. The plucking instrument which can be seen as a modernist, electro-acoustic evolution of traditional African instruments like Kalimba or Mbira is the foundation of the eight untitled, partially blended tunes to be found on this mini-album which combines a playful feel of time- and locationless subaquatic tribalisms with bits of Ambient and leftfield Indietronica, bringing forth a dreamlike, slightly psychedelic feel over the course of its total runtime of 26 minutes, getting especially trippy and fascinating in its fourth track which makes us wonder if these takes would be even greater if experienced throughout a live performance in a small intimate microclub setting for a maximum of 50-80 spectators. Interesting stuff, this and maybe one of the 2018-blueprints for the Future Tribal-genre as well. Ecco una delle tante produzioni di culto che rimarranno prerogativa di pochi e curiosi adepti. Il lavoro è ad opera di Andreas Oskar Hirsch che ha costruito il Carbophone, strumento elettroacustico ispirato alla kalimba africana e al Mbira. Barre metalliche collegate ad un corpo verticale e ulteriori aggiunte fanno produrre a questo oggetto sonorità molto variegate che fanno quasi ricordare certe suggestioni balinesi insieme a quelle più afro. In realtà però al tutto si aggiunge anche un ulteriore supporto digitale e quindi il disco ha elementi anche occidentali, anzi si rivela proprio come una perfetta sintesi tra diverse culture con la sola musica protagonista, senza alcuna parola o testo. FANTASIOSO. However, local weather conditions as well as annually recurring festivities made The Knob, The Finger & The It escape to their inside homes now and again, where they started to explore the miraculous possibilities of modern studio technique. Two tracks on this album – F. F. Erde and Grasebene 3, were taped live outside, and no posterior changes were made. All other pieces were recorded in the studio. Astro Camping is based on recordings from 2012-2016. The first 50 copies come with an interstellar gimmick. The Knob, The Finger & The It are: Tobias Grewenig, Andreas Oskar Hirsch, Volker Hennes. Cover photographs by Andreas Oskar Hirsch. Hailing from the playful side of lo-fi electronics, the three piece The Knob, The Finger & The It (it’s unclear whether one of them is the Knob) offer up a short album of bouncy homemade grooves featuring steady percussive patterns over which electronic squeaks and oscillations bounce and glide. It’s extremely accessible, poppy stuff, especially on tracks like “Come To Ping As Ra” which has a feel-good vibe that’s a little too rare in more experimental music. The second side is a little more sombre. The title track is surprisingly the most sincere-sounding piece, a mesmeric loop of light, xylophone-esque percussive clicks with Clangers-like electronic vocalising and slight string strums above. Longest track “When Pluto Was A Planet” is arguably the most indulgent bit, a steady smile-inducing bassline initially keeping things ticking over nicely before it descends into a chaos that’s the album’s moodiest section. Originally conceived as an outdoor ambient project, this album is a studio production, with the exception of the last track on each side of the vinyl, which are authentic outdoor live recordings. The difference is relatively minor- the deep rumbling soundscape sounds almost as artificial as the other elements, while the other elements are stripped back to give way somewhat. It’s a very accomplished set of tracks with a sound that manages to be both distinctive and familiar at the same time, a bubbly but not jokey set of electronics that are bordering on the timeless. A ranger entre The Residents et certaines oeuvres de Mouse On Mars, Astro Camping joue avec les ressorts de l’improvisation, créant des zones perméables dans lesquelles les mélodies faites de brisures et de conglomérats éparses, forment une entité étrange naviguant dans des marécages de fin du monde, à la faune bizarroïde. … Roeiteam Terschelling Recreatie during a training exercise on 25 April 2011. The course stretched from the harbour of West-Terschelling out into the Wadden Sea and back again. The focus is on the coxswain’s commands which resemble a funk singer’s ones and which make the team become one body working their way through the waters. This is some highly conceptual record from the world of field recordings and it is also a highly fascinating piece of sound art. Row = Wow. The concept is simple. 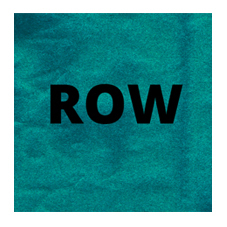 Row is a straight field recording of a Dutch lifeboat team on a training run to the Wadden Sea and back again. The first side out, the second back. The sound elements are: the ocean, the rhythmic rowing, the creaking boat, and the rhythmic vocal exhortations of the steersman. It is quite superb. I have a very soft spot for ocean or any sort of water sounds and I adore boat creaking. (I think the best sounding sport in the world is sailboat racing. Second best: ice hockey.) The rhythmic vocal exhortations add a fantastic touch. The first time I heard this, I became somewhat over-stimulated and I have enjoyed it more every time I have played it. This is the best straight field recording record I have heard since Davide Mosconi’s La Musica Dell’Anno Zero, the foghorn LP. Karla loves this one too. We were both saddened to read that the steersman/ vocalist, Cees Plug, died in 2013. Row is a great tribute and a fantastic LP. Great presentation and pressing as well. This one certainly floats the boat here at HQ. Do you know what to do now? Geweldige muziek, werkelijk waar. Je komt er als luisteraar van in trance en als je niet zo wars van lichamelijke inspanning zou zijn als ondergetekende zou je er bijna zin in krijgen om mee te doen. Techno per un mondo senza elettricita. With particular thanks to Oerol as well as the cultural office of the city of Cologne for making this record possible. … carefully interwoven by means of pitched harmonicas, electric guitars, mini fans, delays and the electric palm leaf, an electroacoustic invention of the artist. The eight titles evoke a space somewhere between interstellar geography (Maxwell Mountains – a plateau on planet Venus), abstract physics (Teilchenbeschleuniger), botanical scenery and animality: Kemeri 5 am features nocturnal crane calls that Hirsch recorded on a bike trip in a swamp near Riga while he was busy with decoding bird messages via morse code. Opossum Pravda is dedicated to the tenacious marsupial that likes to wander around at night and which is able to hang from trees by its tail. Kautschukwaage seems to suggest an exotic setting and provides a link to the rubber bands which one hears resonating in the miniature. Sleeve designed by the artist. 300 copies. Mastered by Joseph Suchy. 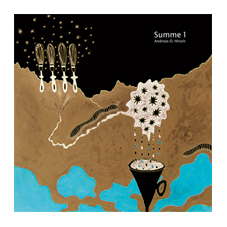 Seems this Cologne-based artist studied film as his first discipline, and it’s possible a certain cinematic sense has passed into his first solo release Summe 1 which has been released as a very nice and not-overlong slice of 12-inch vinyl. On it, he’s shooting for some sense of other-worldly travel, the voyager surveying the more exotic and remote parts of the globe – some tracks do indeed convey “instant jungle danger” or “blistering desert heat” if viewed as a slightly unusual form of library music. You’ve only got to look at the cover art also, with its faux-naif imaginary maps, where important landmarks (or imagined connections between such landmarks) are apparently designated with kitchen implements, such as four egg whisks and a funnel. This playful and creative reinvention of the natural world, done in a charmingly child-like manner, extends to some of the details included in the sounds, such as the track that features field recordings of crane calls; Hirsch takes an interest in these because he’s engaged on another separate project decoding birdsong using the principles of Morse code. (Quite an advance on Olivier Messiaen there.) While he’s a well-travelled fellow, he’s not presenting long- winded field recordings here, nor boring us rigid with his trite observations on foreign lands, a lapse of which many “phonographers” can be found guilty. Instead, he’s using sounds like a paintbox to express his peculiar take on the world, and keeping his statements tight and concise, even when they describe vast imaginary plains and forests. He is aided in this by his unusual combinations of instruments, which includes the playing of rubber bands to achieve a home-made thumb piano effect, along with harmonicas, electric guitars, and small fans (perhaps using them to blow on the strings, a popular device ever since Keith Rowe). As part of this rubber-band activity, Hirsch plays something called the electrified palm leaf, a beautiful half-sculpture instrument he invented which involves elastic bands, carbon rods, and wooden beads inserted into a dried palm leaf, and powered with contact microphones. He’s since gone one better with the invention of the Carbophon, which also appears to be built on the rubber-band principle. A very pleasing and innovative record; we look forward to receiving more leaves from his imaginary Atlas. Poco più di trentacinque minuti di musica che mescolano visioni da quarto mondo alla My Life in The Bush of Ghost con un’attitudine naif degna del più visionario Felix Kubin. Brian Eno se ne innamorerebbe all’istante. Andreas Oskar Hirsch prend nos sens pour les plonger dans un magma de viscéralité mouvante, voyage incessant entre sonorités ethniques et démarche conceptuelle à l’immédiateté accrocheuse, bain bouillonnant de textures acoustiques et de synthétique climatique, d’allers-retours sur des cimes escarpées dont chaque conquête est une ode à la liberté. Julia Bünnagel, Patricia Koellges and Tamara Lorenz release their extraordinary sound on vinyl: The debut SPECTODRAMA contains 3 tracks formed by word collage, brittle sound and elements of minimal noise. Un maxi aussi extraordinaire qu’intriguant qui aurait figuré si j’en avais fait un, dans mon top 10 de 2014. Sorti donc en ce début d’hiver 2014, ce “Spectodrama” présente trois titres autour de la voix, sur une musique entre électroacoustique et compositions, présentée dans une enveloppe en forme de collages et de musiques industrielles. On croirait, sans aucune mauvaise critique ou intention, cette musique sortie du milieu des arts plastiques. Dans une approche très détachée de ce trio allemand, comme peuvent aussi bien le faire Ezramo sur Corvo Records ou The Jist sur Va fongool. Avec une sacrée touche no-wave qui offre un savoureux mélange à l’ensemble.